The Holy Nobleborn Prince Vyacheslav of the Czechs was a grandson of the holy Martyress and Princess Liudmila (Comm. 16 September), and he was raised by her in deep piety. He began to rule at age 18 after the death of his father prince Bratislav (+ 920). In spite of his youthful age, he ruled wisely and justly and concerned himself much about the Christian enlightenment of the people. The holy prince was a widely educated man, and he studied in the Latin and Greek languages. 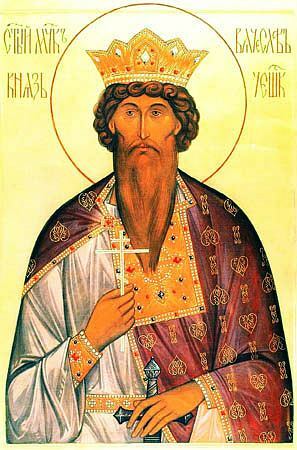 Saint Vyacheslav was peace-loving. He built and embellished churches, and in the Czech capital Prague he raised up a magnificent church in the name of Saint Vitus, and he had respect for the clergy. Envious nobles decided to murder the saint and at first to incite his mother against him, and later to urge his younger brother, Boleslav, to occupy the princely throne. Boleslav invited his brother to the dedication of a church, and then asked him to tarry and stay for still another day. In spite of the warnings of his servants, the holy prince refused to believe in a conspiracy and exposed his life to the will of God. On the following day, 28 September 935, when the nobleborn Vyacheslav went to matins, he was wickedly murdered at the doors of the church by his own brother by birth and that one's servants. His body was stabbed and thrown down without burial. The mother, hearing about the murder of her son, found and placed him in a recently consecrated church at the princely court. They were not able to wash off the blood splashed on the church doors, but after 3 days it disappeared by itself. Repenting himself, the perpetrator of the fratricide transferred the relics of Saint Vyacheslav to Prague, where they were placed in the church of Saint Vitus, which the martyr himself had constructed (the transfer of the relics of Saint Vyacheslav is celebrated on 4 March). The memory of the Nobleborn Prince Vyacheslav is honoured from of old in the Russian Orthodox Church. (There exists conjecture, that the death of the saint occurred instead in the year 929).